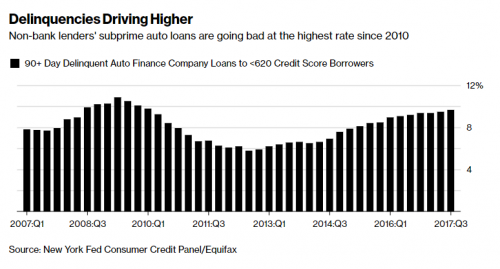 We are in the midst of watching the subprime auto lending bubble burst in its entirety. Smaller subprime auto lenders are starting to implode, and we all know what comes next: the larger companies go bust, inciting real capitulation. Growing numbers of small subprime auto lenders are closing or shutting down after loan losses and slim margins spur banks and private equity owners to cut off funding. Summit Financial Corp., a Plantation, Florida-based subprime car finance company, filed for bankruptcy late last month after lenders including Bank of America Corp. said it had misreported losses from soured loans. And a creditor to Spring Tree Lending, an Atlanta-based subprime auto lender, filed to force the company into bankruptcy last week, after a separate group of investors accused the company of fraud. Private equity-backed Pelican Auto Finance, which specialized in “deep subprime” borrowers, finished winding down last month after seeing its profit margins shrink. 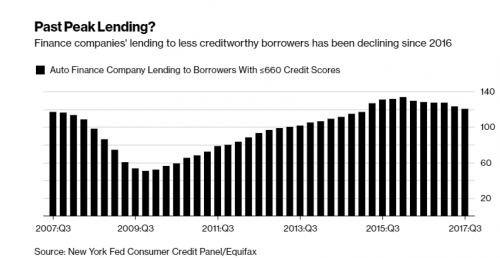 The pain among smaller lenders has parallels with the subprime mortgage crisis last decade, when the demise of finance companies like Ownit Mortgage and Sebring Capital Partners were a harbinger that bigger losses for the financial system were coming. In both cases, rising interest rates helped trigger more loan losses. Representatives for Spring Tree didn’t respond to requests for comment. A lawyer for Summit said "restructuring in a Chapter 11 bankruptcy proceeding is the best strategy to ensure its long term success" and the company is working with its vendors and lenders to meet its obligations. This time around, the financial system’s losses are expected to be much more manageable, because auto lending is a smaller business relative to mortgages, and Wall Street hasn’t packaged as many of the loans into complicated securities and derivatives. As of the end of September, there were about $280 billion of subprime auto loans outstanding, according to the Federal Reserve Bank of New York, compared with around $1.3 trillion in subprime mortgage debt at the start of 2007. There isn’t a standardized definition of subprime borrowers, though it generally encompasses borrowers with FICO credit scores below 600 to 640 on an 850 point scale. "When you think about the effects of housing versus autos, they’re a lot different," said Kevin Barker, a stock analyst covering specialty finance companies at Piper Jaffray & Co. Losses tend to be less severe for car loans because they are smaller than mortgages and borrowers pay them down faster, he said, and the collateral is easier to repossess. With home loans, in many states foreclosures require a lengthy court process. As we all saw from the housing crisis, the smaller shops are usually the first ones to go. The law of large numbers plays to the advantage of bigger corporations and usually buys them more time. The bigger the company, the more the government and institutions care if it goes bust. Smaller companies come and go like it's nothing, because they have no tangible effect on major financial institutions or the US economy. However, this generally only exacerbates the size of the ticking time bomb to come. In early March of this year, we posted our "Signs of the Peak: 10 Charts Reveal an Auto Bubble on the Brink". Our timing couldn't have been better. In that article we pointed out that the key data which seems to suggest that the auto bubble may have run its course comes from the following charts which reveal that traditional banks and finance companies are starting to aggressively slash their share of new auto originations while OEM captives are being forced to pick up the slack in an effort to keep their ponzi schemes going just a little longer. We have seen this bubble coming from a mile away. Also, just as we expected, between record prices (courtesy of what until recently was easy, cheap debt), record loan terms, and rising rates, shoppers with shaky credit and tight budgets have suddenly been squeezed out of the market. In fact in the first two months of this year, sales were flat among the highest-rated borrowers, while deliveries to those with subprime scores slumped 9 percent, according to J.D. Power. 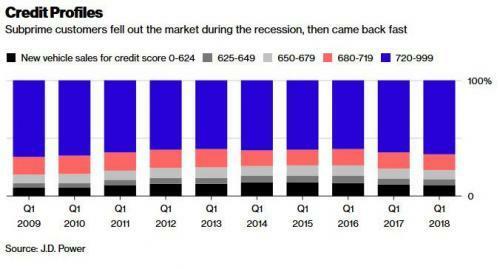 Confirming our observations, Bloomberg notes that while lenders took chances on consumers with lower FICO scores after the recession, partially on the notion that borrowers prioritize car payments ahead of other expenses, several financial companies started to tighten their standards more than a year ago. The result is a surge in the amount of captive financing shown in the chart above, which as we warned is the clearest indication yet of the popping car bubble. We also predicted back in December of last year that certain PE firms would start to feel the pain of their subprime auto bets. However, no one wants to make the point that subprime auto also followed in the footsteps of the financial crisis because it was a bubble that was engineered due to the Fed making it easy to take on cheap debt in order to fuel our nonsense "recovery". The continued focus on borrowing and spending, instead of saving and underconsumption, will ensure not only that these bubbles continue to happen going forward, but they will get larger in size as time progresses.